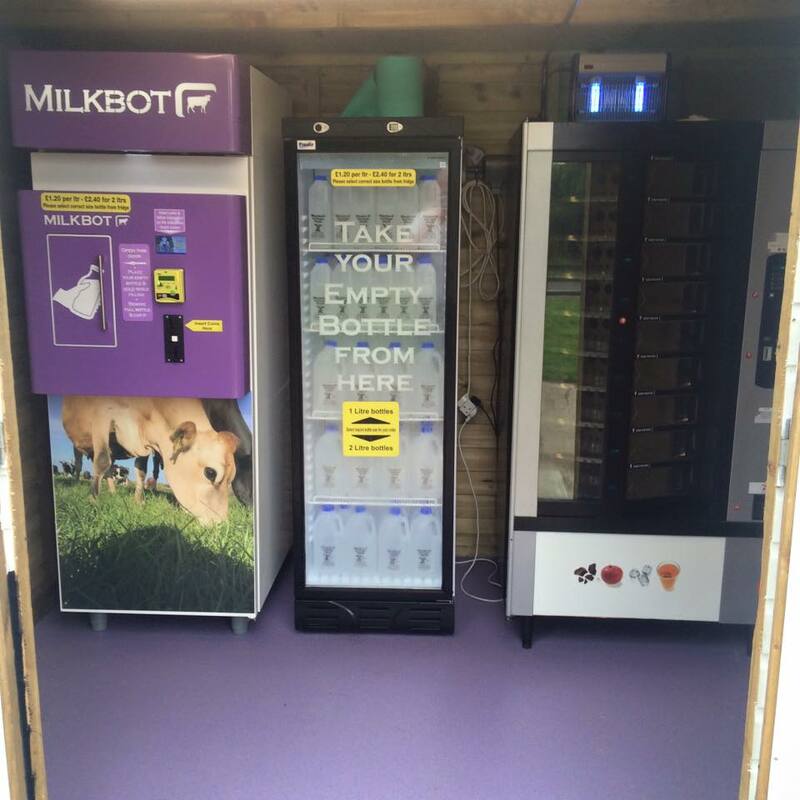 This farm in Wolvey, Leicester opened the farm raw milk vending machine to the public on the 1st of September 2016. Dairy farmer Robert Tilford said it had been a hard couple of years for farmers and he hopes to sell at least 50 litres a day to top up what they had lost in recent years. He said they were very impressed after visiting a dairy in Suffolk that's selling 300 litres a day. Presumably that is Fen Farm Dairy. This Czech dispensing machine stocks milk provided by the farm's 150 grass-grazed cows. Even though the saying is 'the milk goes straight from the cow to the machine' there are some processes in between. According to this article the milk goes through a cooling system, is triple filtered and immaculately clean and ice cold in half-an-hour. They had to go through a process to become licensed to sell the product. The Food Standards Agency had to come out and assess their cows and milking procedures to make sure they adhered to the strict rules. The FSA still sample the milk and run tests periodically but Robert has decided to pay for extra testing to be done weekly in order to give consumers a safe, great tasting product. Raw Drinking Milk must meet the following standards: Plate count at 30'C (cfu per ml) < 20,000 and Coliforms (cfu per ml) < 100. There are just over 170 registered raw milk producers according to the FSA's list. There are reusable, dishwasher safe glass bottles available for purchase in 1 litre and 500ml sizes and the plastic ones are free with the milk. Consumers can pay with coins, contactless card payment, chip and pin or Apple Pay from 7am to 7pm every day. Image: the Milkbot vends raw milk. The vending machine on the right vends free-range eggs. Image: approval of the 1ltr glass bottles. Image: a recent testament to the quality of the milk with low coliforms and TVC's. Compare the coliform forming unit per millilitre (cfu/ml) results to the maximum limit acceptable. A Wolvey farm is installing fresh milk vending machines to counter a drop in industry prices.